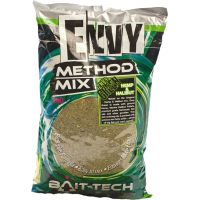 The Bait-Tech Envy Green Hemp & Halibut Method Mix is a green groundbait developed specifically for the fisheries row with the Method Feeder. This green colored groundbait based Hemp & Halibut consists of several attractive ingredients include: ground hemp seeds, ground Marine Halibut pellets, prime fish meal, fish oil and ground corn kernels. This very attractive groundbait can be enriched with the addition of pellets, corn and hemp. During the warmer months The green color is formed by a specific dye, the green color is retained even under water. 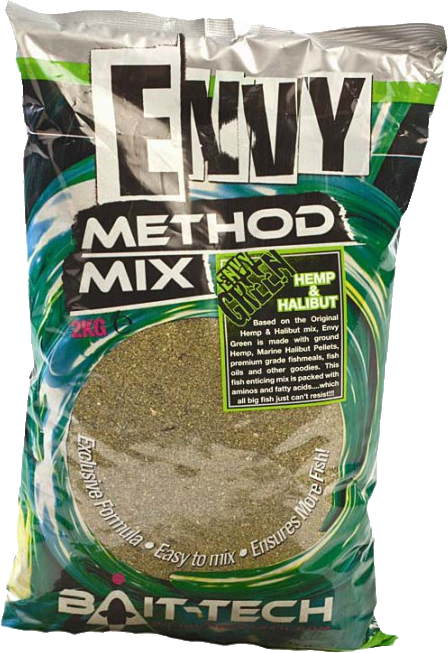 The Bait Tech Envy Green Hemp & Halibut Method Mix is ideal as a ground feed for Method Feeder, Spod mix, mix and Stick as "just" groundbait.